Colin Frederick Hill as born on 12 November 1963 in Uxbridge. He played first for Hillingdon Borough before joining Arsenal as a schoolboy in 1977, becoming an apprentice in 1980, and then on 31 July 1981 Colin Hill signs professional terms. He made his debut for Arsenal’s first team on 20 April 1983 in the Norwich 3 Arsenal 1 defeat. The following season was his one season as a regular for Arsenal, and he played 37 league games, as Arsenal finished sixth in the league. However having made the right back position his own, he was then displaced by the signing of Viva Anderson on 23 July 1984, which placed him primarily in the reserves. In all he played 41 league games (51 in total including the cup games) for Arsenal and scored one goal. In 1986 he had a bizarre move on loan Brighton, for whom he never played, before moving to Portugal on a free transfer playing for Marítimo. They had been promoted from the second division a couple of seasons before, and remained in the top league, but with a ground capacity of under 10,000 were never challengers for a trophy. However he did have the experience of playing further forward, and got eight goals in 30 games. And finally came success with Sheffield United winning promotion to the First Division in 1990. This was followed with Leicester, winning promotion to the Premier League. Colin then went on to Trelleborgs in Sweden for their summer season. I’m not too sure how much fun this might have been as Trelleborg’s stadium, Vångavallen, gained the nickname “Tjongavallen” (a word that might be translated as “the stadium of kicking a football as far away as possible without any thought of direction”). After that it might even have been a relief to come and play for Northampton Town who had by then moved into the new, and rather plush, Sixfields Stadium on the outskirts of town. He also won 27 caps for Northern Ireland. After retiring Colin returned to Leicester FC to work in their Commercial and Hospitality department. And then the THA Group. The only one of those I can find “offers life care and eldercare services for the citizens of Coastal Georgia and South Carolina.” But one reference says that at the THA Group he “set up and successfully run their hospitality department for five years building up a network of hospitality clients that included Jewson, St Gobain, Royal Bank of Scotland, Honda & BT.” So, not old folk in Carolina then. I don’t have any inside information, so I may be barking up the wrong couple of trees here. There are also reports that Colin ran a PR business in Northampton. However we do know that he is now a Commercial Executive for PFA Enterprises (2013). This is easier to track, for as they like to tell the world, the Professional Footballers’ Association is the world’s longest established professional sportsperson’s union (formed as the Association Football Players Union on 2 December 1907). Obviously one or two bits of uncertainty (and errors) here, so if you can fill in any gaps, please do write in. Mention of Colin Hill always reminds me of one of the finest goals I have ever seen . 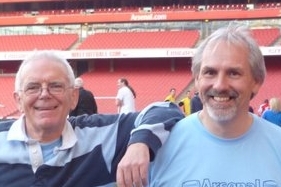 Colin was playing for Arsenal Reserves against Bristol Rovers reserves at the old Eastville ground and scored with a swerving shot from near the half way line . Memory lets me down on the score but the game must have been some 30 years ago and Arsenal definitely won . I don, t suppose anybody out there knows the details of the game . Ken, Colin Hill scored for the reserves at Bristol Rovers in a game on 02/02/85. The final score was 5-2 to Arsenal, the scorers being Lee (twice), Hayes , Davis and Hill. Many thanks for the information . Certainly better than anything Charlie Adams could do !